Worthing will look to put their FA Cup exit behind them on Saturday as they travel to Bostik League Premier Division rivals Burgess Hill Town for an FA Trophy clash. Adam Hinshelwood's troops failed in a bid to reach the first round proper of English football's oldest cup competition, going down at two-divisions higher National League side Ebbsfleet United last time out. Worthing's focus now turns to another national competition - the FA Trophy - as they travel to struggling rivals Hillians for a first round qualifying tie on Saturday. The rivals have already met in the league this season, with Worthing frustrated and held to a goalless home draw back in August. 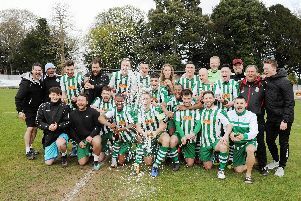 Since then long-serving manager Ian Chapman has left Hillians and they sit bottom of the Bostik League Premier Division. But Hinshelwood is expecting no easy ride when Worthing take them on in the FA Trophy. He said: “They made life hard for us when we met them in the league earlier in the season and came away with a draw. Defender Alfie Young and goalkeeper Lucas Covolan will both miss the game through injury. Loanee Zack Newton is cup-tied.